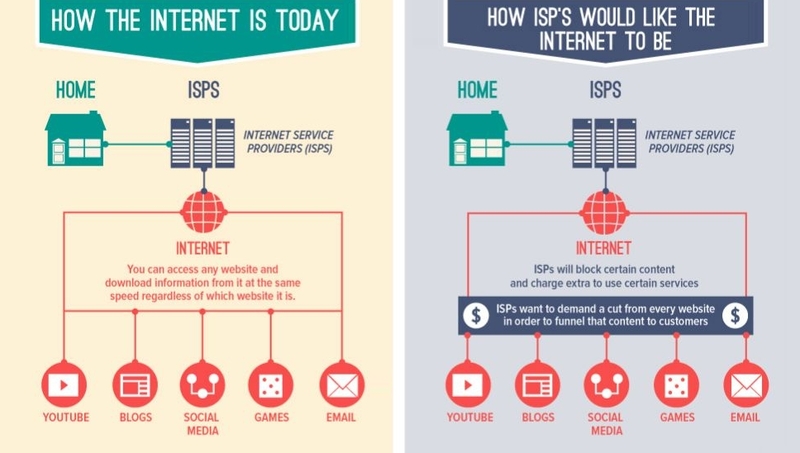 Net Neutrality laws have been around for decades that protect the internet from being limited, throttled, or censored by corporate monopolies, tyrannical government and political parties, nefarious individuals, and unscrupulous organizations. However, in a shocking and truly George Orwellian move, the FCC is trying to take away the freedoms of America and the world by allowing the internet to be censored, limited, and slowed on whatever sites any government or corporation wants, without any legal precedent. In other words, if someone at, say, Comcast, Verizon, or Microsoft decided they didn’t like a competitor’s website, or if they wanted to manipulate the internet by shutting down competitor’s websites so they could maximize their own profits and create an internet monopoly, they would be allowed to just shut it down for any reason. The implications of this are very serious. Currently, this is not allowed, thanks to Net Neutrality legislation which prevents people from doing that which promotes freedom of speech, and prevents corporate monopolies. Large corporations constantly lobby – that is, they hire people to ask the government for personal favors to change laws in their own favor – in order to benefit themselves. Unfortunately, this lobbying is really bad for the little guy. At least Net Neutrality keeps them in check – for now. If net neutrality is abolished and freedom on the internet is destroyed like the FCC is actively trying to do right now, you can say goodbye to all your online freedoms. Not just will you lose your ability to freedom of speech, and blogs who say something the government doesn’t like. For example, if there is a website which tells you to stop this law abolishing net neutrality, then the government can just shut it down just because they want to. But personal freedom is not the only problem – without net neutrality, the cost to your online services will increase, and your internet provider will be allowed to slow down (throttle) whatever websites they want for any reason whatsoever. 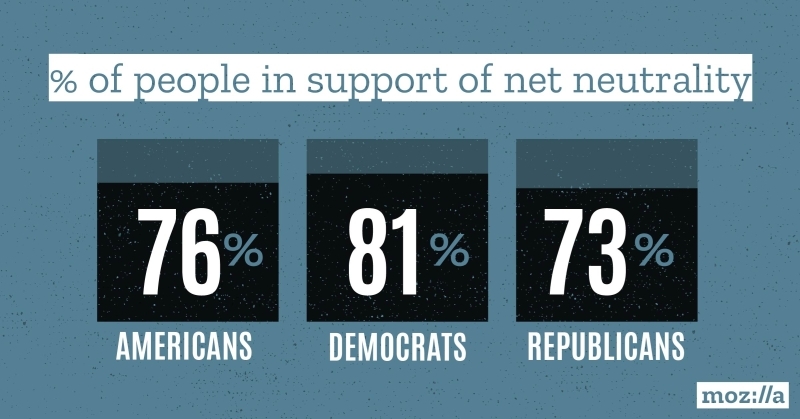 Without net neutrality no longer would the people have a voice online. Entire tyrannical government regimes like famously Egypt, have been toppled because they people had a voice over social media. Now, in many countries, tyrannical dictatorships who oppress and murder their people actively throttle and censor the internet. North Korea is one famous example, and China also severely throttles and censors the internet. In The U.S., however, due to net neutrality, we aren’t a dictatorship yet. But if the FCC succeeds in abolishing internet freedom and gives total power over the internet to a select few major corporations, then a U.S. dictatorship is right around the corner. Net neutrality gives the people a voice, and allows the people to speak freely without fear of the government coming in and shutting them down. Net neutrality allows small companies to not be destroyed because one of their large competitors decides to ask a favor from their friend on the board at Comcast or Time Warner Cable or some other Internet Service Provider (ISP), and gets all the small competitors’ websites shut down or slowed down to a crawl so they will lose business and the large companies will get all the business. If net neutrality is repealed, if they destroy freedom of the internet and allow large corporations to shut down whatever website they want for no valid reason but just because they wanted to, several things will happen. The cost of goods will rise, because when all the small online businesses are put out of business because the large companies had friends who worked for an internet service provider who shut down their websites, now the large companies would have a monopoly which would allow them to charge higher prices on goods because there would be no less expensive smaller competitors. Joan Marsh, president of AT&T, said, “This action will return broadband in the U.S. to a regulatory regime that emphasizes private investment“. In other words, it will allow the large private corporations to have total power about what websites exist on the internet. Google and Facebook said that this would allow telecom companies (like Comcast or Verizon) “to play favorites by charging customers for accessing some sites or by slowing speeds to others“. For example, Verizon could beat up their competitors like Boost Mobile who offers a cheaper service, just by deciding to slow down their websites to a crawl so people visiting Verizon’s competitors’ websites will have a much harder time using any website except the website that Verizon wants them to view. Additionlly, internet providers could charge you fees to access certain types of websites like Facebook, Twitter, or Google. The vice president of Facebook strongly disagreed with the FCC’s proposal to remove net neutrality and eliminate internet freedom. 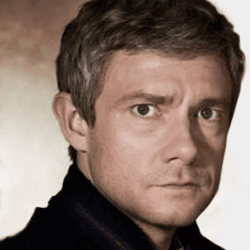 “We are disappointed that the proposal announced today by the F.C.C. fails to maintain the strong net neutrality protections that will ensure the internet remains open for everyone,” she said in a statement. Companies like Netflix, Pinterest, and Etsy exist because of net neutrality, and they believe that the FCC’s proposal with severely endanger and harm innovation and online startups. Not allowing any government or organization to censor or throttle or interfere with the internet has enable these and many other small startups with humble beginnings to be able to grow and thrive. However, with the new FCC proposal to eliminate internet freedom and destroy net neutrality, Etsy and Pinterest representatives say that this will make it so that only the largest companies will be able to afford to pay the new high fees to lobby so that they can have a website and so that their website will be a normal speed and not slowed by their competitors who have the money to pay the bribes by lobbying. Currently, due to net neutrality, there is no way for a bribe to occur. If it did, it would be illegal. 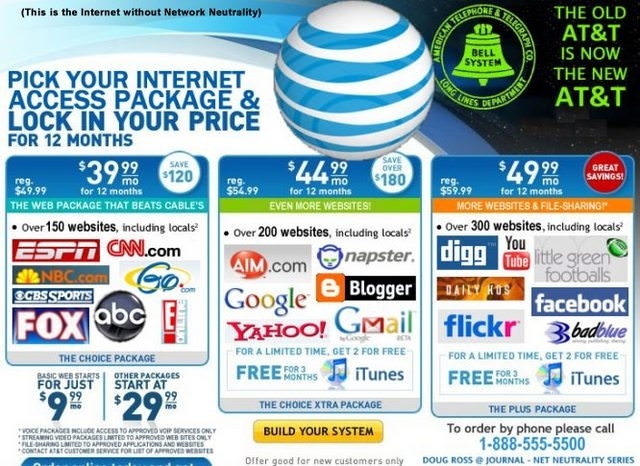 If a large company attempted to manipulate the internet by paying fees to the telecom company to slow down their competitors, then currently it would be illegal due to net neutrality. 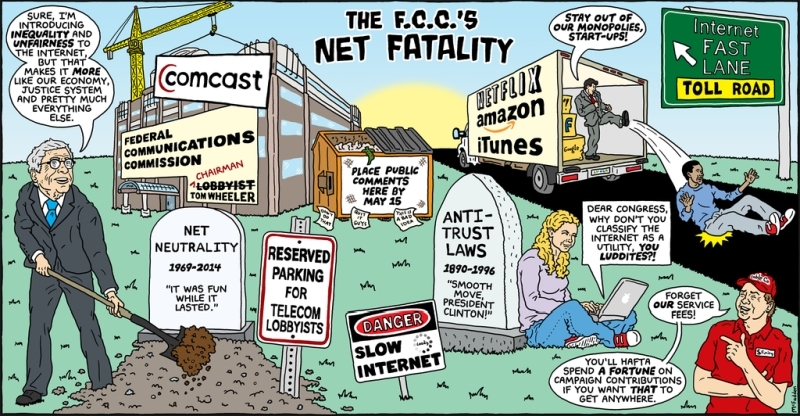 However, with net neutrality gone like the FCC is trying to do right now, then any huge corporation will be able to pay fees to shut down their competitors. Effectively, it will legalize internet bribery, and only the strongest will survive in the end. Another terrible impact from eliminating net neutrality is that access to popular services like Netflix or Amazon Video will have significantly higher monthly fees (possibly double or triple), causing many people to no longer be able to afford to use their streaming services. This price increase would happen because video streaming services rely on a fast connection, and with net neutrality gone the internet service companies will raise costs and these costs would be passed on to Netflix, which in turn would be passed on to their users. Other costs will also go up, like subscriptions to Amazon Prime, and other popular internet services. Your home and business internet connection costs will also likely go up, possibly dramatically, if the FCC succeeds in repealing net neutrality and destroying internet freedoms. Internet providers could also require a fee in order for you to access a website. For example if you wanted to read “The Onion“, your internet provider would be allowed to charge you a fee to watch it, just like cable companies did with Pay Per View. The difference, however, is that The Onion would not get any of these fees, but rather the internet provider, like Verizon or Comcast or TWC, would be able to profit off you reading online humor. The end result would be the eventual shutdown of The Onion because with dramatically less users the website could not afford to stay up anymore. The same goes with access to social networks like twitter, facebook, linkedin, pinterest, and others; search engines like google and bing; access to online maps; blogs and news; online shopping like amazon and ebay, as well as smaller online ecommerce stores; online email like gmail, yahoo, and aol mail; online maps like google maps or a variety of map apps on your phone; apps and games for your phone; and so many other things will no longer be free to access and use without paying a ransom to your internet provider. If net neutrality is destroyed like the FCC is trying to do, then your internet company can charge you more for every device you plug in. Say you have a family and there are 3 laptops, 3 desktops, and 5 phones in the house, along with 2 smart tvs, and even an ipod. With net neutrality gone your internet provider would be able to charge you for every new device you connect, making you unable to use many of your devices without paying their ransom. With net neutrality, they aren’t allowed to do that, but if the FCC succeeds, you can look forward to $300 per month internet bill for a much slower internet that is heavily censored. The time to act is now. If you want to have freedom of the internet and don’t want the internet to be like China or North Korea, and don’t want much higher fees on line services, censored websites, and blocked and slow internet pages, please contact your local congress and representative to tell them to stop this tyranny. Battle For The Net now has a page that allows you to directly call your local congress representative. I never give out my phone, but I trust this one and gave my local congressman a call. Signing a virtual petition isn’t going to be enough this time; this time we need to actively call our representative in order to get them to stop the FCC from eliminating internet freedom and destroying small online businesses, blogs, and websites. We only have 3 weeks left to stop the FCC from this tyranny, so give your local representative a call! Send them letters and demand that they stop the FCC from eliminating net neutrality. 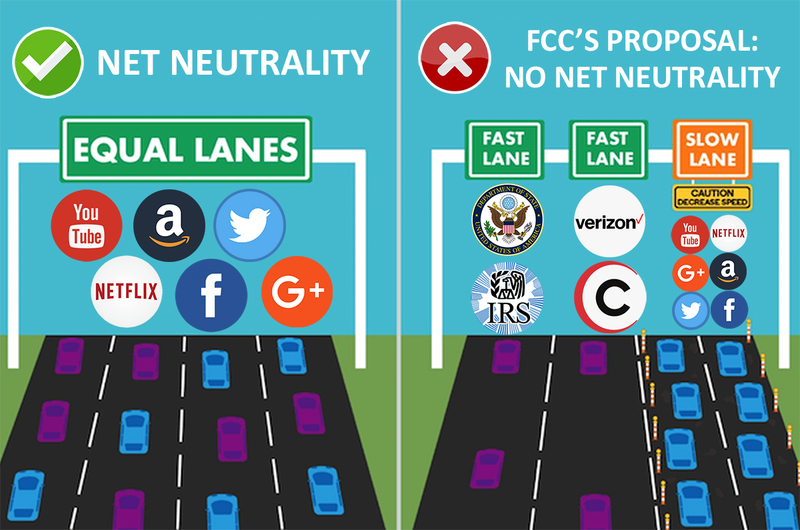 Introduce yourself, be polite, and say: I support “Title Two” net neutrality rules and I would like you to publicly oppose the FCC’s plan to repeal them. Please contact the FCC Chairman and demand that he abandon his current plan. We don’t need legislation, we need you to stop the FCC from gutting the existing rules. You can actually get directly through to your actual representative by entering your number in the site and it will call you and connect you directly with your local representative after entering your zip code. If it goes to voicemail though, you can still leave a message. Update: There is also a change.org petition which now has over 1.2 million signers. This petition is not just a petition but is actually created by the website change.org. Lastly, spread the word! Share it on Twitter, Facebook, Linkedin, Google+, and wherever else you can, so they can’t get away with this. Keep in mind, if net neutrality is killed, then we won’t be able to even do this anymore, because the government would be able to just shut down and censor any sites which try to get the people to gather, do petitions, and have a voice. So save net neutrality while we still can! This may be our last chance. Protect your privacy while online searching with a VPN like TorGuard. 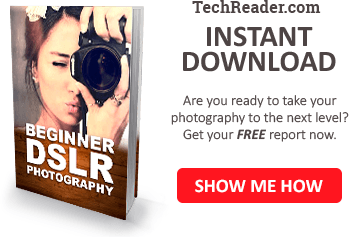 On The Plausibility of Hoverboards | Do Real Hoverboards Exist? Is Levitation Technology Real?